Opening with debut single “Harder To Breathe,” the hitmakers packed a lot of content into the set. A clear highlight came during “She Will Be Loved” as fans in the audience released paper lanterns into the sky. The Halftime Show also included a pair of pre-announced cameos. Travis Scott took the stage following a reference to the Bubble Bowl performance from SpongeBob SquarePants. The rapper powered through his Billboard Hot 100-conquering “Sicko Mode.” Ending with a stage dive, it made for another of the evening’s most memorable moments. Atlanta rapper Big Boi later made an appearance for a high-energy version of Outkast’s “The Way You Move.” Keep an eye peeled for the anthem to rocket up the iTunes charts in the coming hours. 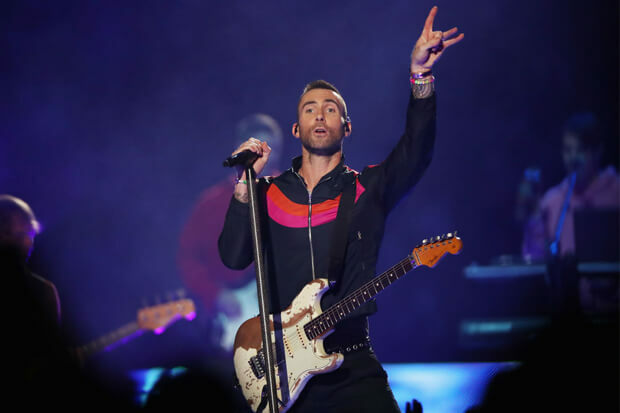 After that, Adam capped off the show by stripping off his shirt during an Xtina-less take on “Moves Like Jagger.” In comparison to jaw-dropping spectacles from the likes of Beyonce, Lady Gaga and Katy Perry in recent years, Maroon 5’s set felt a little safe. However, there is no denying that they kept the audience entertained with some of their most memorable releases. Watch them in action below! Did you love the performance? Let us know below, or by hitting us up on Facebook and Twitter!